The battle lines are being drawn for what is becoming one of America’s largest natural-resources fights in decades, pitting the mining industry against defenders of a way of life and an economy that are inextricably linked to one of the United States’ most intact and productive ecosystems. The Bristol Bay region in southwest Alaska, often referred to as “America’s fish basket,” is home to the most valuable salmon fishing ground in the United States. This pristine area supports the production of more than half of the world’s sockeye salmon, one of the most popular and prized types of salmon. Additionally, the region supports substantial catches of four other salmon species and herring. In total, the salmon fisheries of Bristol Bay support the equivalent of nearly 10,000 full-time jobs and create $1.5 billion in annual economic output. It is a prime example of a conservation economy, defined as a sustainable economy that directly depends on a healthy ecosystem. But a large mineral deposit is located at the headwaters of two of the major rivers that flow into Bristol Bay, and international mining companies are eager to extract the hundreds of billions of dollars in gold, copper, and molybdenum found there. Extraction of these precious metals will require open-pit mining—digging up and separating the ore with toxic chemicals—on a massive scale with very few precedents. Because of this, mining in the Bristol Bay region has become extremely controversial, drawing the attention of Alaska Natives, fishermen, and other stakeholders. Specifically, opponents have serious concerns with one particular mine—the Pebble Project—which happens to be the furthest along in the process. A project of the Pebble Limited Partnership, which teams two multinational mining companies, Anglo American plc and Northern Dynasty Minerals Ltd., the Pebble Project would be one of the world’s largest open-pit mines. While the partnership has yet to release a plan of operations for the mine or apply for federal permits, its basic characteristics have been specifically detailed in preliminary assessments filed with the U.S. Securities and Exchange Commission. Additionally, an economic study commissioned by the Pebble Limited Partnership and released in May 2013 provided more details about the proposed mine. Because the deposit’s ore is so diffuse, the mine would require not only an open pit thousands of feet deep and two miles to three miles wide, but also tailings reservoirs to hold toxic mine waste that could cover more than 7,600 acres, or 12 square miles, and would remain in perpetuity. There are no cultures of the other almost 30 that can today rely on wild salmon because the salmon runs have been destroyed. Only [in] one place—only one place—can cultures carry on the traditions of their ancestors, making the transition from prehistory to now. The technology changes, but the attitudes, many of the beliefs, and the impact on the culture are still there. And that’s the Dena’ina and the Yup’ik of this area. While the Pebble Project would be located on lands owned by the state of Alaska, open-pit mining requires the discharge of huge amounts of polluted water, extensive dredging, and the filling of waterways with mine waste. Consequently, EPA and the U.S. Army Corps of Engineers must first issue permits for these activities under the Clean Water Act. Because of the severity of potential impacts on Bristol Bay’s fisheries and tribal communities, EPA has undertaken a comprehensive, scientific “watershed assessment” of the Bristol Bay region to assess these risks and inform its future decision making. First, EPA should finalize its rigorous, peer-reviewed assessment of the Bristol Bay watershed so that policymakers have a sound scientific basis for future natural-resource management decisions and have the data they need to protect the region’s fisheries and economy. Second, to reduce risk to the region’s natural resources and provide prospective mining companies certainty in developing their business plans, the final draft of EPA’s Bristol Bay watershed assessment should clearly identify any specific areas that are essential to the health of the region’s salmon stocks and would therefore be particularly sensitive to mining activity. Fulfillment of these policy recommendations will enlighten the public, EPA, and other governmental agencies; reduce risk to the environment and the thousands of jobs that depend on it; and provide mining companies with improved certainty if or when they draft development plans and permit applications. Mining in the Bristol Bay region, and particularly the proposed Pebble Project, presents an unusually stark choice between two different paths of natural-resources development: the extraction of finite hard-rock minerals and a sustainable economy based on a valuable renewable resource—salmon. Thousands of jobs in fishing and tourism, as well as the traditional way of life for the region’s native communities, hang in the balance. … [I]n the headwaters of Bristol Bay, conditions are nearly perfect. Human activity that ruins salmon habitat, such as dam building, logging, farming or road construction, is virtually non-existent. The Bristol Bay region encompasses nine major rivers, each with an array of tributaries, as well as Lake Iliamna, the largest lake in Alaska and seventh-largest body of fresh water in the United States. “FRONTLINE” describes the landscape as “a vast spongy swamp crisscrossed with streams and punctuated by small lakes. Abundant ground and surface water are constantly mingling through a gravel-based soil that is highly permeable.” Consequently, discharges of water pollution would likely spread widely and be very difficult to clean up and remediate. Moreover, because this landscape is unspoiled by dams, pollution, or overfishing, the fish stocks supported by the Bristol Bay ecosystem are among the most bountiful on the planet, providing one of the last great examples of the once-innumerable runs of salmon on both American coasts. Every summer, runs of five different species of salmon, including pink, chum, chinook (also known as king), coho, and sockeye, begin the return journey from the ocean waters of Bristol Bay back up through a network of rivers to spawn and die in the freshwater streams where they hatched. Perhaps the best way to understand the unique character of the Bristol Bay region is to compare it to places where wild salmon once were abundant. One such region is that of the Columbia and Snake rivers of the Pacific Northwest, where wild salmon once could be found in massive numbers. Anecdotal evidence suggests that during the 1800s, about 1.5 million salmon and steelhead trout returned annually to spawn in the Snake River. Human activities have substantially reduced the amount of suitable spawning habitat in the Snake River … Even prior to hydroelectric development, many small tributary habitats were lost or severely damaged by construction and operation of irrigation dams and diversions; inundation of spawning areas by impoundments; and siltation and pollution from sewage, farming, logging, and mining. Because of these impacts, salmon runs in the Snake River declined to around 125,000 fish in the 1950s and then dwindled to only a few hundred in the 1990s, showing how sensitive salmon populations can be to industrial activity. Development of the Pebble Project will require a similar array of supporting infrastructure, including construction of new dams and impoundments, roads, and pipelines that will be a significant source of waterborne sediment. This new infrastructure will cross dozens of streams, each of which could easily block fish passage and eliminate upstream spawning habitat. The massive decline in salmon populations in the Snake River shows just how easy it is to lose world-class stocks of fish. Without great caution being exercised, Bristol Bay salmon face a similar peril. Commercial fishing is vital to the American economy, and Alaska is the nation’s crown jewel for seafood production. In 2011 Alaska fishermen hauled in about 35 percent of America’s catch by value, more than three times as much as Massachusetts, the state in second place. Alaska fishing also provides more than half of our total landings by weight, more than four times as much as Louisiana, the runner up. Even by Alaska’s standards, Bristol Bay’s salmon fishery is a huge economic driver: One study from the University of Alaska found that in 2010 it created the equivalent of nearly 10,000 full-time jobs across the United States and $1.5 billion in total economic output. The thriving Bristol Bay ecosystem underpins all of these jobs because it supports an astounding number of wild fish. Since the early 1990s annual upriver runs of sockeye salmon from Bristol Bay have averaged more than 37 million fish, the biggest and most valuable run of sockeyes anywhere in the world. Since 1991 Bristol Bay’s commercial sockeye fishermen have landed an average 25.6 million fish annually—about 51 percent of the global sockeye catch. (British Columbia’s Fraser River region comes in a distant second place, contributing about 11 percent.) And exports of the salmon return $250 million to the U.S. economy, comprising nearly 6 percent of all U.S. exports of seafood in 2010. Just two of the Bristol Bay watershed’s major rivers—the Nushagak and the Kvichak—together contribute half of Bristol Bay sockeye landings, equivalent to a quarter of the world total. The proposed Pebble Project would be located at the headwaters of these rivers. This geographic predicament highlights the importance of careful study and planning by policymakers to protect the dozens of miles of downstream salmon habitat that serve as the beating heart of this sustainable fishery. The Bristol Bay region also attracts recreational anglers from around Alaska and beyond, who come for both the salmon runs and world-class rainbow trout. In the last major study on the sector, researchers from the U.S. Forest Service reported that sport fishing is the region’s most important economic activity outside the commercial salmon harvest, with more than $61 million spent in Alaska in 2005 on Bristol Bay fishing trips. Wildlife viewing and other types of tourism are also important economic drivers, supporting thousands of visits to Bristol Bay annually. The region’s unaltered ecosystem and dramatic landscapes harbor thriving populations of moose, caribou, brown bear, grey wolves, bald eagles, and numerous other species once common elsewhere in the United States, many of which rely heavily on salmon as a food source. This extraordinary natural heritage has already inspired the establishment of two of Alaska’s major national parks nearby—the Lake Clark National Park and Preserve to the east of the Pebble deposit and Katmai National Park and Preserve to the south. The Togiak National Wildlife Refuge is also in the region. These nationally recognized protected areas and the wildlife they support all contribute to a vital tourism industry in the Bristol Bay region. … [S]almon is more than just what’s for dinner. Salmon feeds the ways in which the culture operates. Functionally and economically, salmon is the cornerstone. Subsistence fishing for salmon is the most readily available way to fill freezers and pantry shelves. In parallel with the region’s cash economy, subsistence harvest of fish and other wildlife in Bristol Bay represents a critical resource for its native communities. The Alaska Department of Fish and Game estimated that between 2002 and 2011 the annual harvest of wild foods was 1,087 pounds per household, with salmon comprising 56 percent of that total. The agency also projects that replacing wild foods gathered in the subsistence harvest would cost between $4,851 and $14,973 per household but notes that “the cultural, social and nutritional” value of the wild foods would probably be impossible to replace with imports. Declines in salmon stocks from mining impacts on habitat would mean both a loss of household income and the erosion of an indigenous way of life that has thrived for millennia. 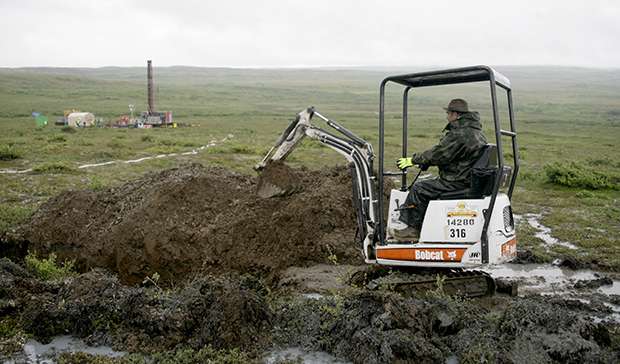 While there are at least 16 active mining claims in the headwaters of Bristol Bay, the Pebble Project has gained most of the attention because it is furthest along in the planning process. British mining giant Anglo American plc and the Canadian firm Northern Dynasty Minerals Ltd. together form the Pebble Limited Partnership that would own and operate the Pebble Project. Anglo American is the second-largest mining company in the world and made $6.2 billion in profits last year. Even under normal mining operations—free of accidents or natural disasters—the Pebble Project would likely have significant environmental impacts on the natural character of the Bristol Bay headwaters. All of the necessary infrastructure will cumulatively bring tremendous industrialization of a truly unspoiled landscape, destroying streams and wetlands. According to EPA’s draft watershed assessment of the Bristol Bay region, even without a disaster, mining the Pebble deposit would likely cause the degradation or loss of between 24 miles and 90 miles of streams and between 1,200 acres and 4,800 acres of wetlands, depending on various mine-size scenarios. The mine itself will likely have both underground and open-pit components, meaning that the rocks, trees, and soil overlaying the desired precious metals would all have to be removed. The open pit would consist of a large hole in the ground “up to three miles wide and thousands of feet deep,” according to “FRONTLINE.” Because the type of ore present in the Pebble deposit is very diffuse, requiring the excavation and processing of vast quantities of earth and rock to be economical, the Pebble Project could be the largest open-pit mine in North America and one of the largest in the world. 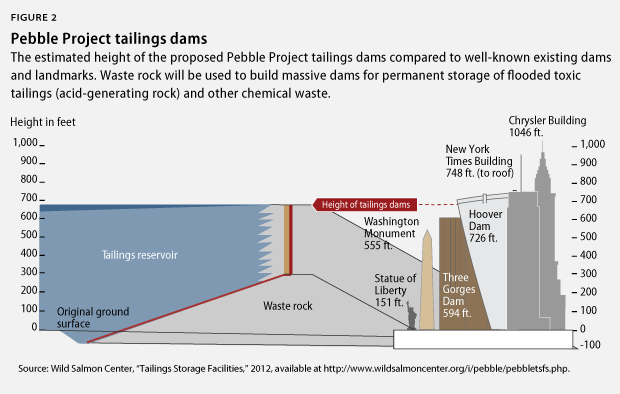 Additionally, the Pebble Project could generate up to 10 billion tons of waste, all of which would need to be stored on-site in vast rock piles and tailings reservoirs. These reservoirs, which will hold toxic waste, including the chemicals used to leach out the precious metals from the mined ore, require the construction of large dams and impoundments and then the filling in of previously untouched valleys. (see graphic below) Depending on the actual size of the open-pit mine, the Pebble Project will likely require multiple tailings-storage reservoirs, each with multiple dams and earthen embankments. And, of course, a major infrastructure project such as this needs energy, but no electricity grid exists in the region. 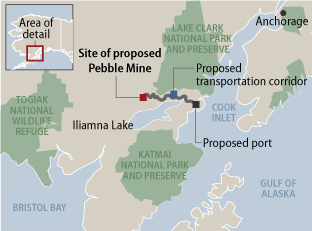 The Pebble Limited Partnership has proposed building a 378-megawatt natural-gas-fired power plant at the mine site and another 8-megawatt unit at the port, enough electricity for nearly 300,000 homes (compared to the 311,000 housing units in the entire state of Alaska). Because there are not enough natural-gas resources in the Bristol Bay area, the fuel will need to be transferred to the site via one of the new pipelines mentioned above. The Pebble deposit is also located within the most seismically active region on Earth. While the exact seismicity of the mine site has not yet been studied, one of the strongest earthquakes ever recorded in North America—the 1964 Good Friday Earthquake, measuring 9.2 on the Richter Scale—occurred less than 300 miles away from the Pebble deposit. The tremor permanently shifted surface lands over more than 100,000 square miles and was felt more than 1,000 miles away in the state of Washington. Salmon are particularly sensitive to copper and may avoid habitat polluted by the metal, suffer stunted growth, or even die if exposed to high-enough concentrations. EPA preliminarily estimates that copper runoff from mining in the Bristol Bay region—such as what could result from the Pebble Project—could directly impact salmon more than seven miles downstream from the mine and indirectly harm the fish through impacts to their food source as far as 35 miles downstream. Hard-rock mining for precious metals is a dirty industry with a contemptible history in the United States. The legacy of pollution, abandoned mines, and taxpayers left with staggering cleanup bills raises many questions for the policymakers considering large mining proposals, especially when they are in places as special and unique as Bristol Bay. In terms of pollution, EPA has estimated that “mining in the western United States has contaminated stream reaches in the headwaters of more than 40 percent of the watersheds in the West.” A review by two environmental consulting groups of 25 mines that have operated since 1975 determined that 76 percent of those mines exceeded surface-water or groundwater quality standards for harmful pollutants. The report also determined that 85 percent of mines located near surface water—such as the Pebble Project’s proximity to the Bristol Bay’s watershed—had “elevated acid drainage potential,” meaning the leaking of toxic leachate from the mines. Cleaning up these contaminated sites is expensive, and taxpayers are often left to foot the bill when mining companies go bust. At Oregon’s Formosa Mine, for instance, more than 18 miles of streams have been polluted by acid mine drainage, affecting salmon, trout, and other fish species. After mine operations extracting copper, zinc, and other metals stopped in 1993, acid-mine-drainage containment systems at the mine began to fail. The Formosa Mine has become a highly contaminated Superfund site, and because the original owners of the mine “appear to be defunct corporations,” according to EPA, taxpayers will likely pay the estimated $20 million in cleanup costs. For comparison, the Formosa Mine site produced about 68,000 tons of ore before production ceased, and the Pebble deposit is known to contain more than 11 billion tons of ore. The Formosa Mine is just one of the approximately 500,000 abandoned mine sites in 32 states across the country. EPA estimates that cleaning up these abandoned mines could cost taxpayers $35 billion or more. The Pebble Project’s remote location may pose particularly difficult issues for cleanup capability. Cleaning up and reclaiming abandoned mines requires significant equipment and human capacity, which could be made more difficult with this mine’s isolated location. As described above, the Pebble Project could have major impacts on the conservation economy of the Bristol Bay region: Activities such as commercial fishing, recreation, and subsistence harvest by native communities that depend on a healthy ecosystem could be indelibly harmed. As such, the top priority of the federal government should be the protection of the ecosystem that underpins the Bristol Bay region’s unparalleled salmon fishery. This priority stems from EPA’s duty under the Clean Water Act to maintain the integrity of our nation’s public waters in order to protect fish, wildlife, and recreation. To fulfill this responsibility, EPA must first finalize its watershed assessment, which will provide state and federal decision makers with a foundation of peer-reviewed scientific information about the region’s ecosystem and natural features. The final version of the watershed assessment should also identify any specific areas in the region that are of critical importance to the health of the region’s salmon stocks and sensitive to disturbance from mining activities. Delineating these areas will improve the certainty for prospective mining companies, giving them clear guidance on where development is appropriate. As a result, this delineation could also save private investment and taxpayer dollars that might be squandered in futile attempts to win federal permits for mining activities in inappropriate locations. In response to a petition by Alaska Native groups and commercial fishermen, EPA undertook a watershed assessment of the Bristol Bay region to “evaluate the potential impacts of large scale mining development” in the region. The first draft of the assessment was released in May 2012; after incorporating public comment and expert review on the document, EPA released a second draft in April 2013. Both drafts of the assessment indicated that even in the absence of a catastrophe, normal mining operations would cause substantial environmental damage. Significant public input was received on the first draft, with more than 230,000 comments submitted. Approximately 90 percent of these comments were in support of EPA’s findings, according to the Bristol Bay Regional Seafood Development Association. Like all risk assessments, this assessment is based on scenarios that define a set of possible future activities. To assess mining-related stressors that could affect ecological resources in the watershed, we developed realistic mine scenarios that include a range of mine sizes and operating conditions. These mine scenarios are based on the Pebble deposit because it is the best-characterized mineral resource and the most likely to be developed in the near term. In addition, the Pebble Limited Partnership’s May 2013 economic-impact study projected jobs and value from a proposed mine that is the size of the largest of three possible scenarios for production considered in EPA’s draft watershed assessment, indicating that the agency’s study is realistic and on target rather than hypothetical. We applaud EPA for its effort to establish a solid science-based summary from which to evaluate likely impacts to Bristol Bay from large-scale mine development. We believe that the preponderance of evidence shows clearly that gold and copper mining in the Bristol Bay watershed threatens a world-class fishery and uniquely rich ecosystem, and we urge the Administration to act quickly to protect the area. Because it is crucial to understand the complex ecology and water resources of the Bristol Bay region before any further steps are taken toward development, EPA should finalize this scientific assessment so its findings can be used for future federal and state permitting decisions. In order to build the Pebble mine, the Pebble Limited Partnership (and any other companies interested in mining in the Bristol Bay watershed) will need to get numerous permits, including one from the U.S. Army Corps of Engineers to dispose of mine waste into nearby waterways and wetlands. Much evidence already suggests that mining in the Bristol Bay watershed could have significant adverse impacts on the region’s salmon habitat and the associated commercial and recreational industries. In its final watershed assessment, EPA should identify any areas that are critical to maintaining the health of the ecosystem and salmon stocks and therefore are too sensitive to serve as mining-waste sites. Pinpointing these highly sensitive areas within the Bristol Bay watershed would not only reduce the risks from mining activities to salmon and the region’s thousands of salmon-dependent jobs, but it would also provide the mining industry improved certainty for its future permitting and investment decisions. Given what we know about Bristol Bay’s fisheries and the sensitivity of the upstream salmon habitat to mine activities, such advance planning is well warranted to ensure protection of the region’s fisheries and wildlife before the approval of any industrial development. Commercial fishermen and salmon processors would also reap the benefit of improved certainty from this action. Every year salmon-dependent businesses must make major investments and logistical commitments to run their boats, hire crews, and set up seasonal processing facilities with thousands of workers, all based on a reasonable expectation of the fish returning in their historical numbers. Because of its potential impacts on fish populations, unrestricted mining in the Bristol Bay region could create uncertainty and liability for salmon-dependent businesses, reducing investment and jobs throughout the industry. Alaska’s Bristol Bay region is an outstanding example of America’s conservation economy, with a thriving salmon fishery that supports the equivalent of nearly 10,000 full-time jobs, $1.5 billion in economic output, and the well-being and culture of the region’s Alaska Native communities. All of this could be put at risk by proposals to mine in the Bristol Bay watershed, with the most significant threat posed by the Pebble Project. Even barring an accident or natural disaster, EPA’s draft watershed assessment has indicated that the Pebble Project could have major impacts on the undeveloped character of the area, including the destruction of streams and wetlands, acid mine drainage, and the construction of huge containment structures to hold toxic tailings that will last in perpetuity. If there were to be a failure of a tailings dam or other accidental discharge of toxic mining waste, the impacts on the Bristol Bay salmon fisheries would be felt for decades to come. With the above facts in mind, EPA should finalize its draft watershed assessment as soon as possible, so that it and other federal and state agencies can use the document for upcoming permitting decisions. Additionally, in the final version of the watershed assessment, the agency should identify any areas that are too sensitive to serve as mining-waste dumps because they are essential to maintaining the health of the salmon-based ecosystem and the jobs that depend on it. Taking this action would allow companies such as the Pebble Limited Partnership to determine whether mining in the region still makes business sense. The Pebble Project forces policymakers to decide whether large-scale industrial development is compatible with the unspoiled character of the Bristol Bay region. It also requires them to compare the relative costs and short-term benefits of extractive industries to those of a sustainable conservation economy. The Pebble Project represents a key litmus test for determining what kind of economy and natural-resources policy we want in America in the century ahead. Jessica Goad is the Manager of Research and Outreach for the Public Lands Project at the Center for American Progress. Shiva Polefka is a Research Associate for the Ocean Policy program at the Center. Michael Conathan is the Director of Ocean Policy at the Center. Christy Goldfuss is the Public Lands Project Director at the Center.